The conclusion of the US elections marks a watershed for the rest of the year and beyond. Besides removing uncertainty and market focus about the election results themselves, the elections’ conclusion marks a new phase for markets. That’s because the election results profoundly affect market perceptions of the two big near term risk generators, the EU crisis and US fiscal cliff. Now that the elections are over, we’re already seeing a resurgence of news coverage on EU crisis related events, particularly those concerning Greece, Spain, and slowing growth in the EU in general and in Germany in particular. Except perhaps for the German economic slowdown, these are all old news. What is new news is that they’re now back on the menu for public deliberation, statements and thus, headlines. No sooner were the elections over and we had dour statements from both the Euro commission and ECB President Draghi regarding the EU’s outlook. Expect more such “updates” ahead. The US elections have just given the EU’s corpses another month to putrefy. After a month of being stuck in the closet, they will stink that much more as we reopen the door on them. Here are some tips to help you filter the noise from the signal. Cause a complete freeze on lending to EU banks that could crash EU banking unless the ECB is able to guarantee unlimited money printing similar to that promised by the Fed after the Lehman Bros bank collapse. It’s unclear whether Germany and the other funding nations will accept that, but that’s a separate discussion. So deferring a Greek default buys time. Like Greece, it too cannot repay what it owes, and whatever chance it has of doing so is shrinking along with its economy. Unlike Greece, it has yet to submit to a bailout and conditions it can’t keep and to the extent that it does, will only weaken its ability to avoid default and recover. Until Greece defaults or some other event scares credit markets and pushes Spain’s borrowing costs up enough to force it to request a bailout, Spain does not pose an imminent threat to markets. It claims to have cash for “the rest of the year,” which is only about 7 weeks but that’s enough to keep the focus on Greece, which presents a nearer term default and contagion risk. Still, Spain remains the real threat to the EU, so negative news on Spain could rock markets. The most likely source of trouble is coming elections in Catalonia. It’s a net contributor to Madrid, and resentment about subsidizing other regions has fed secessionist sentiments. That in turn has brought mutterings from Spain’s military, which does not have a long, proven history of submission to civilian rule in times of turmoil. Weekend EU budget talks collapsed as demands for an extra £13.8 bln in EU spending were rejected by the UK, Germany and Holland, whose voters would oppose further contributions to the EU. Talks are expected to resume Tuesday. Ongoing failure to settle the budget could further undermine confidence in the EU. The common denominator to all of the above is, in sum, crisis fatigue. Both debtor and funding nations are hitting the limits of financial pain they can accept. Their ability to bridge the gap through money printing (the most likely solution in the near term), debt forgiveness, or other means will determine whether the EZ as we know it survives. The elections also profoundly increased risk of failure to quickly resolve the US’s fiscal cliff, the sudden ‘cold turkey’ wave of tax increases and spending cuts that threatens to swamp the fragile US recovery. Of course, these would go a long way to cutting the US deficit, but that is a longer term benefit (and so is of limited interest to politicians and markets at this time. Optimists hold a deal will get done because otherwise the consequences will be devastating for the US economy and so common sense will prevail. Pessimists point out that the same argument failed to apply to US debt ceiling negotiations in the summer of 2011. These demonstrated Washington’s inability to face hard choices due to political gridlock. Risk assets got smacked and the US lost its S&P AAA credit rating. So much for depending on Washington’s sense of responsibility. As the Economist suggests here, there is room for compromise that allows both Democrats and Republicans to claim victory. Here are some other potential market movers for this week not as directly related to the conclusion of the US elections. The above two primary market movers for the coming week create the third one, ongoing anticipation of weak data and earnings. As we’ve noted in prior weeks, for the past year risk assets have continued higher despite deteriorating data, fueled by little other than hopes for more stimulus. If this downward trend in risk assets continues, it may signal that central bank’s ability to manipulate markets has hit its limits. If so, risk asset markets can then be expected to continue to deteriorate with the global economy. Japan (the world’s #2 or #3 largest economy, depending on how you measure) faces its own fiscal cliff and needs to overcome its own political impasse in order to avoid running out of cash before as early as the end of November. This risk is fading, as Japan’s legislature appears close to a budget deal by around November 20th. Still, any last minute delays could get markets nervous in a hurry, so stay alert for news on this. Using the bellwether S&P 500 as our overall risk barometer, this week shows a continuation of the deterioration we noted last week. After moving higher early in the week, the index reversed and closed a decisive 2.4% lower near its lows for the week, suggesting a testing of deeper support next week. 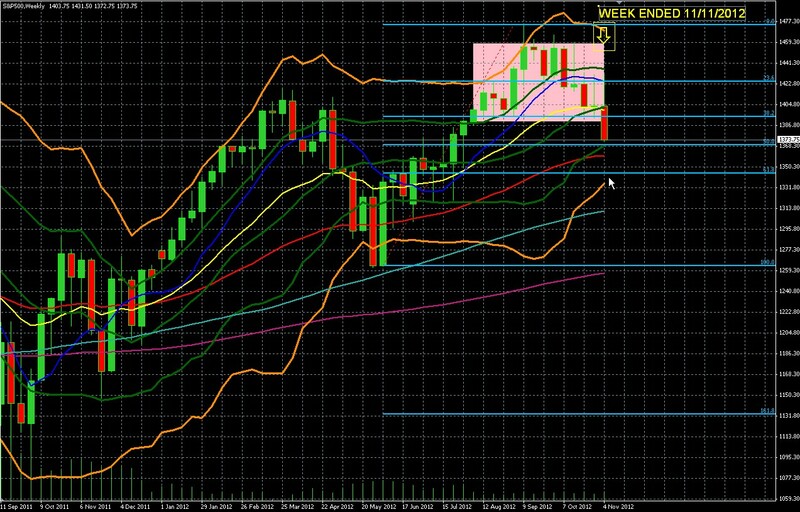 If that 1350 support area breaks, it means the index has firmly entered its Double Bollinger band sell zone. That, along with the breach of the 50 week EMA means we’ve dual confirmation of downward momentum on the medium-long term weekly chart. For those not familiar with this simple yet super-useful indicator, here’s a quick summary of how to use it. As we’ve noted repeatedly, gold is neither risk nor safe haven asset, rather it moves as a currency hedge. In other words, when confidence in the most widely held currencies’ purchasing power drops, gold tends to rise, and vice versa. Gold is priced in US dollars, so it tends to move in the opposite direction of the USD. 2. They probably aren’t thrilled about the USD either but see it as a lesser evil vs. risk currencies. Is a clear message that markets are negative on risk assets AND view the USD as merely a lesser evil compared to risk currencies or other risk assets. This bit of inter-market analysis is a classic example of the importance of having basic awareness and understanding of currency markets, even if you don’t directly deal with them. 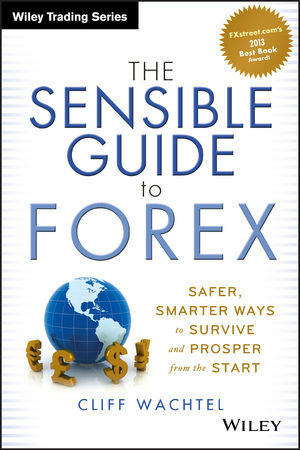 For those seeking a highly useful guide to forex markets and simple, safe ways to use them to protect yourself against the decline of the USD and other currencies subject to debasement by money printing, see here. See here for details, or consult any good economic calendar for more information. Of the group, US retail sales and the FOMC meeting minutes pack the most market moving potential. No changes from our overall outlook. The most practical of these for our readers is that most major currencies are at risk of debasement through excessive money printing. Regardless of whether you agree with that policy as best for the common good, it’s terrible for those based in the USD, EUR, JPY (or other currencies subject to these policies) who are trying to save and build wealth for future needs. It’s a good time to hold cash, but a bad time to be in most of the major currencies. So now what? Most of us need to diversify our holdings into currencies more likely to hold their value or appreciate, yet most who try their hand at forex markets lose money. What’s a brother to do? See here for the first and only guide to a range of safer, simpler solutions for protecting yourself from the effects of declining currencies.